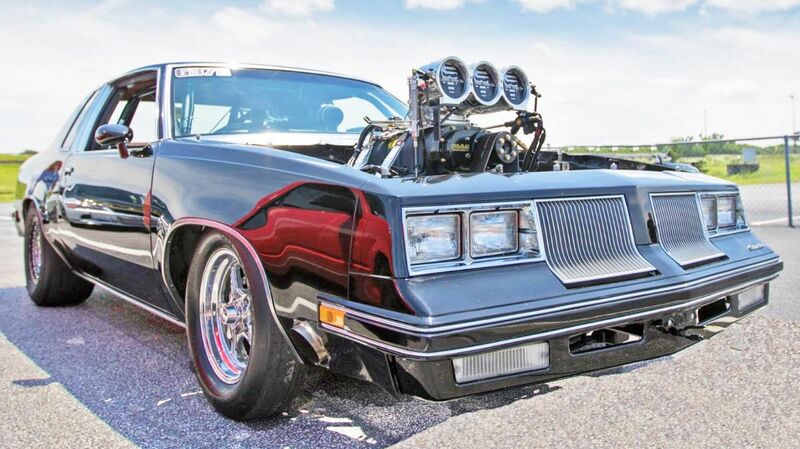 Get ready to have your socks blown off by the dynamic performance of this 1650-hp BLOWN 516 Cutlass. The Cutlass is decked out with a 516 big block Chevy engine with a 1071 Littlefield blown alcohol combination, three-piece powerglide with a 180 and a PTC 10-inch converter. It's running 24 pounds of boost through the blower, with a wicked scoop on the hood and 275 tires. Watch it do burnouts and leave the competition in the dust! Its throaty roar is like music to a race car fans' ears. The Olds Cutlass originally hit the market in 1961, and quickly become one of the most popular cars on the market. The early 1980s Oldsmobile Cutlass Supreme was designed as a luxury car with an aerodynamic restyling from the standard issue of the late 1970s. The rear drive four-door sedan also featured a taillight lens restyle. According to General Motors enthusiasts G-Body, it was the 1981 Cutlass that ushered downsized cars into the NASCAR cup competition. Disappointingly for Oldsmobile, the Cutlass never scored any NASCAR victories in the 1981-1085 seasons, and NASCAR teams moved on to the Regal, Grand Prix and Monte Carlo SS. In 1982, Oldsmobile introduced the popular Cutlass Ciera, a V6 powered front-wheel drive A-body. This and the Cutlass Cruiser wagon became key parts of the Cutlass Supreme line in 1982. 1988 was the final year for the rear-wheel drive Cutlass Supreme, and it was rebadged as the Cutlass Supreme Classic, a 2-door coupe that was replaced by a front-wheel drive version with the Olds 307 engine. Check out this awesome blown Cutlass in the video below, and SHARE it if you want one!